A person that organizes and/or operates a business in Duval County and possess thoughtful thinking, energetic, and optimistic characteristics. The Jacksonville Business Journal played a fun role in shining some light on how this event came to fruition. Despite the on-again, off-again weather, there were 115+ in attendance throughout the night. Entrepreneur Night in Jacksonville was the first for many. There were lots of talk about the eccentric energy that folks brought into the event and significant conversations that were left lingering as the evening dwindled down. (P.S) Did you think we weren’t going to debut the ENTNight Soapbox in Jacksonville? Think again! 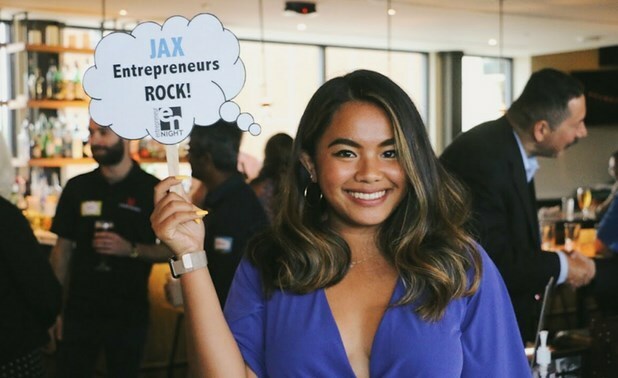 Here are a few distinct Jacksonville Entrepreneur(s) that braved the box. Watch your step getting up. Watch your step getting down.